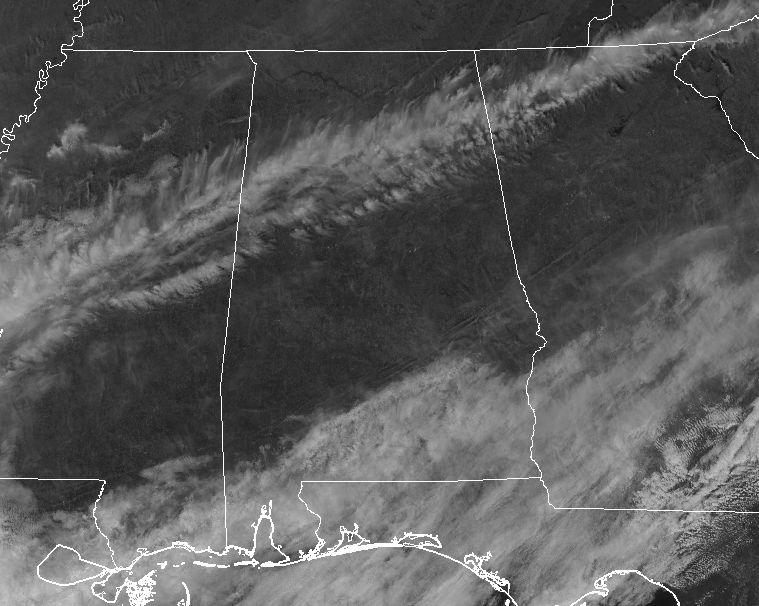 We have a good bit of sunshine across Central Alabama at midday but we do have some clouds streaming in from the west-southwest across the northern parts of the area, along with some clouds over the extreme southeastern parts. It’s a clean sweep on the radar at the moment, but there is just one stray shower over the northwestern corner of Butler County down in South Alabama. Temperatures, as we approached the midday hour on Thursday, were already up in the 70s across the area, we are only seeing mid-30s to the upper 50s across the area from north to south today. Birmingham is at 45 degrees at the moment, 30 degrees cooler than the 75 degrees we saw just 24 hours ago. While much of Central Alabama will have mainly sunny skies for the rest of the afternoon and into the early evening hours, there will be some clouds streaming in from the west and southwest streaming over the northern parts of the area. While a brief sprinkle or light shower may be possible over the southeastern parts of the area, we’ll stay dry. Afternoon highs will only be in the lower 40s to near 50 degrees along and north of I-59, while in the lower 50s to near 60 degrees south of that. Skies will become cloudy for the evening and through the overnight hours, but no rain is expected. We’ll be chilly with lows dropping into the upper 20s to the upper 30s across the area from northwest to southeast. If you don’t mind the cooler temperatures for the first half of the weekend, Saturday will be a decent day. We’ll have a mix of sun and clouds throughout the day, but clouds will begin to move back in during the evening and overnight hours ahead of a system that will eventually begin to move into the area from the north and northwest by the beginning of the week. Saturday’s highs will be in the upper 40s to the upper 50s from north to south with lows in the mid-30s to the mid-40s.